Fully-analog pedal offers 16 unique wave shapes. British pedal maker Vein-Tap.com has unveiled the new Dark Arts Tap Tempo Phaser, the latest addition to the company’s Dark series of stompboxes. Features of the fully-analog pedal include: 16 unique wave shapes; a Voice knob that controls the ratio between Vibe and Phase mod tones, or between Phase and Dry signals; a Multiplier control that changes the ratio of the tapped tempo, from half, full, dotted eighth, double, triple, and quadruple time; a Feedback control that allows the user to customize the phase sound from subtle or extreme; and a pulsing LED that reflects the custom phase wave. There’s also an on-board soft-touch Tap Tempo footswitch and soft-touch true bypass footswitch. 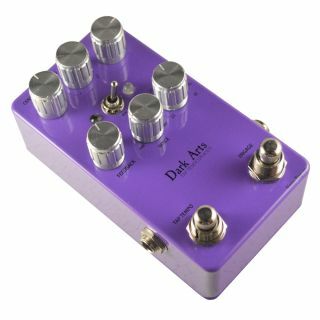 For more information on the Dark Arts Tap Tempo Phaser, head over to Vein-Tap.com.